There are many new faces on the McGill football Redmen as the team prepares to kick off its 132nd season on Sunday against powerhouse Laval in Quebec City. Heading into his first full season as Redmen bench boss, head coach Clint Uttley is hopeful that a roster that includes 50 returning players and about 40 new recruits, as well as a revamped coaching staff will help the team bounce back after two consecutive 0-9 seasons. There are many new faces on the McGill football Redmen as the team prepares to kick off its 132nd season on Sunday against powerhouse Laval in Quebec City. Heading into his first full season as Redmen bench boss, head coach Clint Uttley is hopeful that a roster that includes 50 returning players and about 40 new recruits, as well as a revamped coaching staff will help the team bounce back after two consecutive 0-9 seasons. “We brought in a really good group from AA and AAA Quebec CEGEPs this year,” says Uttley, who moved up from his post as associate coach and defensive co-ordinator to take the head coach position for the final three games of last season. Joining Uttley on the headset and clipboard brigade to provide that grooming and mentorship are new coordinators Pat Boies (offence) and Mickey Donovan (defence). 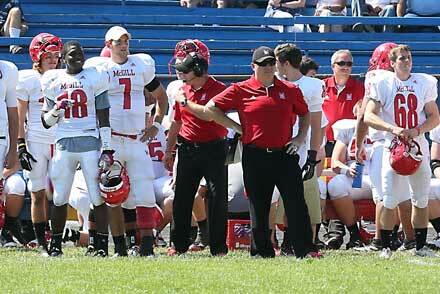 Donovan comes to the team from Western University, where he coached the team’s linebackers for the past four seasons. 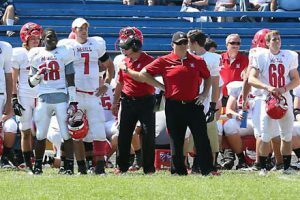 Boies, meanwhile, comes to McGill from Quebec City-area CEGEP Collège François-Xavier-Garneau, which he led to a AAA CEGEP league Bol d’Or title as head coach last season. Sophomore Dallon Kuprowski, who led Canada to a gold medal at the IFAF Under-19 world championship in July at Austin, Texas, will get the start at quarterback against Laval. He’ll be backed up by junior Jonathan Collin, who won the Bol d’Or championship in CEGEP football and was voted rookie of the year in the Quebec University conference in 2009 before suffering a season-ending knee injury in the opener of his sophomore year, and fifth-year man Ryne Bondy. The QB situation, Uttley says, will be evaluated on a daily basis, with no clear No. 2 or No. 3 designation assigned by the coaching staff. Uttley and his staff will also focus on discipline, something the team was short of in their August 26 23-9 exhibition loss to Queen’s, in which the team took 19 penalties, including 10 holding calls. The Queen’s game cost the team the services of rookie linebacker Carl Jobin-Shaw to a torn muscle. But the Redmen will get a boost on the offensive line with the return of Laurent Duvernay-Tardif, a medical student who has been doing an internship in the Gaspé. The highly touted third-year man, who Uttley calls “a legitimate pro prospect,” is expected to play despite only getting three days of practices in full pads. As for any goals or predictions for the upcoming season, Uttley says he likes to keep it simple and direct.